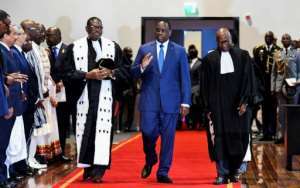 Macky Sall on Tuesday embarked on his second term as Senegal's president pledging "constructive" dialogue with the opposition and reforms to spur development. Sall urged optimism as "it seems new economic perspectives are opening up for our country," a reference to Senegal's plans to enter the hydrocarbons sector in 2021-22 via two ambitious oil and gas developments. Clad in a navy blue suit, the trained geologist swore "before God and before the nation" to serve the people as several visiting African leaders looked on. Also present was Mark Green, administrator of the US development agency USAID. Sall, 57 and a self-declared "social liberal", chose the new city of Diamniadio, some 32 kilometres (20 miles) from Dakar a product of his Emerging Senegal Plan (PSE) launched in 2014, to make his address. "In vesting their confidence in you once again your fellow citizens have validated your record and backed your social project, to say the least," said Constitutional Court president Pape Oumar Sakho. Sall garnered a 58 percent vote share, well clear of former prime minister Idrissa Seck on 20 percent, with the rest of the pack left trailing to win easily in a single round on February 24. 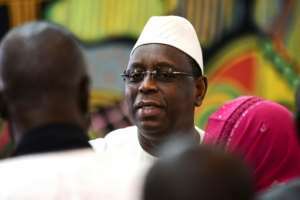 Helping to clear Sall's path to victory was the authorities' invalidation of several opposition candidacies including those of Karim Wade, the son of presidential predecessor Abdoulaye Wade (2000-12), as well as popular Dakar mayor Khalifa Sall. Both were disqualified over convictions for misuse of public funds. The election sidelined the Socialist Party and the Senegalese Democratic Party which have dominated politics since independence from France in 1960. Although the disqualifications outraged the opposition, Sall insisted he would rule "for all Senegalese, hence "I renew my call for... a constructive dialogue open to all political, economic and social forces." The opposition has so far shown no sign of wanting to grasp any olive branch Sall might extend since he was officially proclaimed as poll winner on March 5. Sall, who left the ceremony for the presidential palace in an open-topped saloon with his wife, also said he would particularly look to aid the young, pursuing employment and training policies promoting "the entrepreneurial spirit and new technologies." He added he would commit to "public policies favouring women and girls," ensure "decent housing" for all and "safeguard the environment".